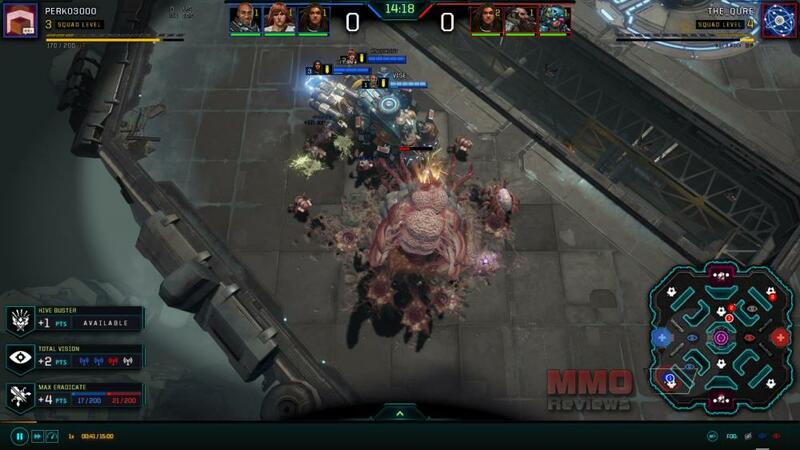 A free to play RTS meets MOBA where players battle in single player PVP duels, Dropzone puts you in charge of three sci-fi tank-like units as you battle through a map filled with aliens and a rival player’s team, try to recover “cores” to score yourself points and claim victory. With elements of strategy, PVP, PVE and team unit customization the game offers a variety of features to make a very tactical title. The core objective in the game is to score as many points as possible in the fifteen minute time limit, both players do this by destroying static alien Hives dotted around the map and claiming the dropped “cores” that they leave behind. Each unit that the player controls, tank-like mechs known as Rigs, can carry a single core and they must be transported to a central neutral terminal to score a point per core. As players are in control of three units at once, and each unit has its own personal abilities, players will require good micromanagement skills as they quickly cycle through their three units to give them independent orders, or controlling them all at once to move them collectively. As the game progresses and the Hives are destroyed they will continue to respawn, evolving so that the alien Kavash creatures grow more powerful over the duration of the game and scale with the strength of the players. At the end of the game the team with the most points wins, if it is a tie then the game enters sudden death and whoever uploads another core first is the winner. From these classes are the currently available nine pilots, each of which has their own unique skills and tweaks that give them some individuality in combat. When starting a battle players choose the three characters they wish to fight with. Every rig is fully customizable, with modular upgrades that allow players a much more open management of their team; players can use earned currency to purchase new module parts, from weapons to utility tech, and equip it to their new rig changing its playstyle and its physical look. Modules have an upgrade value to signify how many times that pilot must be upgraded before that particular module comes online and can be used in combat. Upgrades come from earning XP, typically done by killing Kavash AI or taking down enemy players, in turn this will grant an Upgrade and the player can choose which of their pilots to apply it to; this level of strategy allows for a lot of different playstyles and even before the game begins players must have in mind their personal tactics such as whether to aim for a high level upgrade with a Rig, or focus on having lots of smaller (less powerful) upgrades across all three units. Destroying Hives is the primary source of earning points, similarly is destroying the enemy player’s Rigs and stealing any cores they might have been carrying; as the uplink is a central terminal that both players will use it means that denying a turn in is a vital tactic. At the start of each game players are also given three sub-objectives that they can try to complete, such as controlling all of the map’s vision watchtowers, being the first team to destroy a set number of Kavash, or set number of Hives, and so on, with points instantly earned upon completion; the more difficult the task the more points that can be earned.